One day Chance the colt had a bad tummy ache. Chance was really scared. A doctor came to visit him. Even worse, the doctor said he’d have to go to the hospital for an operation! Based on true events, Oh No! Not the Doctor! 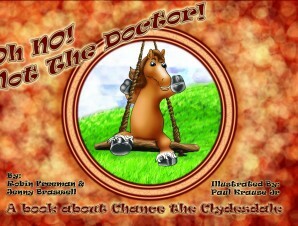 is about a young colt who overcomes fear and sickness. He returns home stronger and happier. This hardback book makes a perfect gift for any children, young or old, who are facing challenges in their lives. read to my grandson`s many time`s,i have 3 boy`s,they love it. My daughter received this book as a present when she was 1. I would read it to her and she loved the pictures. She is now 3 and still loves this book. It helped her learn about going to the doctors and loves going to see Chance and the rest of the gang whenever she can. This book is adorable! 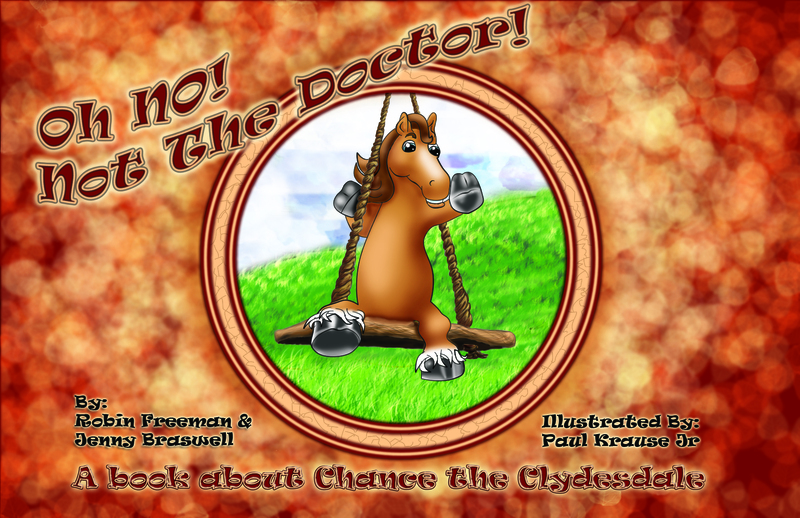 Perfect for teaching a young horse lover that a check-up is nothing to be afraid of! Loved it! 5 stars! This was a great read! Such a great story about Chance and his struggle to get well. I bought the book for my nieces on a visit to the farm. They love reading and looking at the pictures of Chance. I would recommend this book to anyone who have children that love horses. It’s also a great book to read to a classroom or daycare for show and tell!! I have this book in my position because of the talented person that created the illustrations. The expressions and the character of the images are perfect for children to watch when they are listening to a parent or person reading to them. I must say I love the drawings of Chance as an adult and it was amazing to see Paul create the images. This is a beautifully illustrated book with a wonderful story. It has helped my son to not fear the doctor anymore. He loves Chance! One of our favorite books…both our 8 yr old and 2 year old love to read this one! As a mother/grandmother I think this is a great book.My hope anytime I buy a book is to entertain, to enlighten, to have a chance to learn/ teach a life value or at least a chance for discussions. This book was wonderful. Really a delightful and beautiful book. Loved the pictures and story. Love the story and the pictures. A wonderful book for children. Helps prepare them for the doctor. And those who visit Chance can readily identify with his story. I love this book! Chance has had to be very brave. I love the illustrations as well. Very nicely done!